ABS Season 2 Finale Has Begun! Minifig, Utensil Goblet . Once we reach the building deadline, each judge will score his or her own favorite creations from each corner house (an equal number from each house). The scores from each judge will then be combined with the scores from the other judges, and one corner house will emerge victorious! Last season, Azure claimed the victory. You can take a look at the season 1 finale here. Be sure to visit their stores the next time you're looking for LEGO pieces! This will be the last time you will see these corner house colors for a while, because we'll be switching things up for season 3. 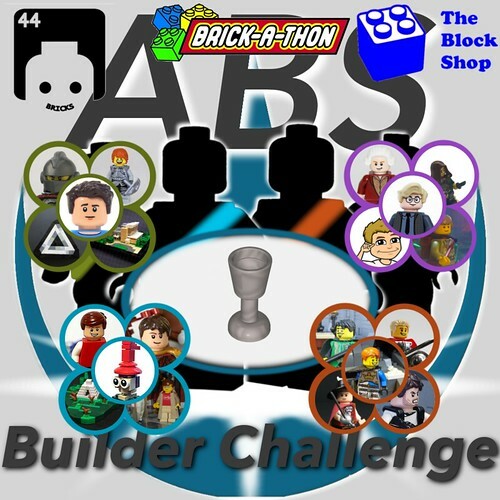 The best way to follow the creations this round is in the ABS Builder Challenge Flickr Group. Join that group, and also follow the builders on Flickr and get ready for some action! (their Flickr profiles are linked to below) So let's take a look at each corner house and get introduced to the competitors. Due to various factors, there was some switching of who represents what corner house (for example, Mark is competing for Dark Orange even though in season 2 he competed on behalf of Lavender). There are also some competitors from season 1 participating. Each week, we will have a recap in case you can't follow the whole thing on Flickr (we expect 80+ creations to be built during these next few weeks), and if social media is your thing, you can find us on Instagram, Facebook, and Twitter. Hang on tight, because there's about to be a flood of creations! All of which will be posted in this flickr discussion.